Nathan: Writing your debut novel is, in many senses, a leap of faith. Everyone knows it takes huge amounts of time and emotion to craft a publishable manuscript, but there is obviously no guarantee that it will find a home with either publishers or readers. Since one of the themes you address in your first novel The Other Tree is faith, I was wondering if you could tell us what made you take the leap from short fiction into novels. DK: I’ve always been passionate about writing, and I’m a firm believer in the power of stories to transform, entertain, comfort, and inspire people. Growing up, I spent a lot of time in libraries, and books were my gateway to fantastic worlds and exciting adventures. They got me through some tough times, and left me with some brilliant memories. Early on, I decided that this was what I wanted to do with my life. I wanted to create entertaining, intriguing, and heartfelt stories that would bring the same kind of joy to others that my favourite authors had brought to me. In primary school, I was always jotting down quirky stories and odd little poems, and in high school I progressed to writing moody vignettes and dramatic fantasy stories. I was greatly influenced by the TV series I’d watched as a kid, including the classic 1983 adaptation of The Legend of the Condor Heroes. I was captivated by long-form storytelling, with the gradually unfolding plots, the organic and sometimes heartbreaking evolution of the characters, and the emotional journeys full of triumph, tragedy, and the getting of wisdom. In late high school, my focus turned towards the writing of serials. I drafted countless episodes of fantasy epics and space operas, but there was no clear pathway to progress with these. During university, I took a hiatus from writing to concentrate on my Psychology degree. By the time I graduated, I was champing at the bit to get back into writing, and the stories I wanted to tell were still long-form narratives. I wrote five novel-length practise works before I finally wrote The Other Tree, and while those five stories will never see the light of day, they were instrumental in developing my skills as a writer. It was only after I’d written The Other Tree, and started working on my second novel, Hunt for Valamon, that I seriously turned my attention to writing short stories. Short stories are a completely different beast. I have great admiration for writers like Isaac Asimov and Terry Dowling, who can deliver high-concept, affecting stories in such a concise number of words. I think, in part, it was all the experience I gained through writing novel-length works that gave me the confidence to dive back into the short story format with pieces like ‘Morning Star’. I was also inspired by my sister Anne Mok, whose short stories were being published in some wonderful anthologies. So, I didn’t really make the leap from short stories to novels so much as I sidle-hopped from novels back into short stories. It’s true that there are no guarantees when it comes to getting published or finding an audience, but I believe that the harder you work, the luckier you get. I believe that if you write stories you’re passionate about, and commit to improving your craft, then you increase your chances of creating something that will resonate with others. There are uncertainties in any creative career, and I think it’s important to focus on the things you can control. It’s less about having faith, and more about having passion, persistence, discipline, and a willingness to learn and grow. I believe that if you’re doing what you love, and creating the best work that you can, then every step you take brings you closer to your goals. Nathan: Having acknowledged that novels and short fiction are quite different creatures, do you have a preference for writing either of them? DK: I enjoy writing both, and different stories fall more naturally into one format or the other. Short stories allow me to explore a concept, a scenario, or a premise, in a form that is often intense and immediate. A zombie slacker facing their own mortality, a storytelling god in search of an ending, an android chasing answers to the edge of the universe. There’s something deeply satisfying about creating a story that is compact and complete in itself. However, my passion leans towards long-form storytelling. There’s often greater scope for sprawling set-pieces, interwoven plot threads, slowly unfolding mysteries, increasingly tangled politics, and a huge cast of complicated characters with diverse motivations. Novels also tend to have more room for the quiet moments, the camaraderie and hijinks, the digressions and reversals, the heartbreaking betrayals and painstaking redemptions. I love seeing characters grow and evolve over time. As a reader, novels give me more time with characters whose company I enjoy. More time to get to know them, more time to celebrate and grieve with them, more time to learn and err, to forgive and grow with them. As a writer, I love creating stories that take the characters on a long and twisting road, full of hell and high-water, smooth sailing and surprises. I like to weave puzzles, lay groundwork, and build arcs, and I find that novels give me a bigger plot of land to work with. For me, short stories are like exquisite terrariums, requiring a pair of tweezers and very steady hands. Novels are like sprawling acreage full of hedge-labyrinths and cranky wombats, requiring sturdy boots and a compass. Nathan: Your second book – Hunt for Valamon – is being released in April this year. Before we hear more about it, how was tackling your second novel? Did your approach change at all after writing The Other Tree, and if so, can you give us a peek into how? DK: My debut novel, The Other Tree, was an urban fantasy adventure that brought together my interests in natural history, botany, mythology and ancient civilisations. In many ways, it was a fairly straightforward narrative with a tight focus on a handful of main characters, and it was set predominantly in a contemporary world. 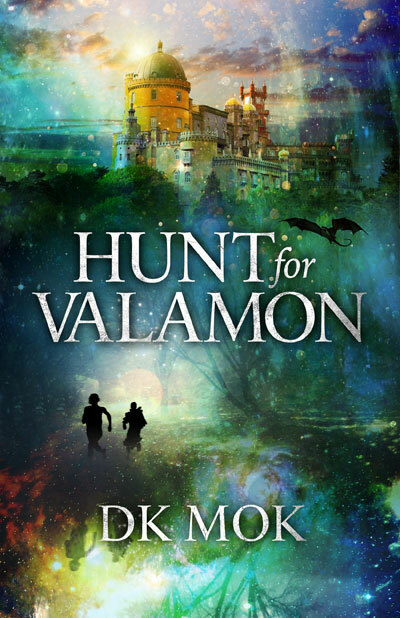 When it came to deciding on my next novel, I already knew I wanted to write Hunt for Valamon, even though it meant a temporary departure from urban fantasy. However, the idea for the story had been simmering in my mind for years, and I finally felt ready to tackle it. It was far more ambitious than anything I’d written before. It was epic fantasy, with intertwining plot threads, complicated story arcs, and a large cast of characters with complex and conflicting motivations. I had to create the world and its history, its geopolitics and its magic system. Writing Hunt for Valamon was more challenging largely because of the scope and nature of the story. My approach from book to book remained much the same: I’m a plotter and a basher, and that’s still the system that works best for me. However, all the experience I gained during The Other Tree made me a better writer, and I’m not sure I could have wrangled so many plot threads and characters in Hunt for Valamon if I hadn’t written The Other Tree first. Nathan: So tell us about Hunt for Valamon. How would you describe it to someone who has a passing familiarity with the speculative fiction genre? DK: Hunt for Valamon is an epic fantasy adventure about a vanished prince, and the reclusive cleric determined to solve the mystery. When Prince Valamon is mysteriously abducted, a young healer, Seris, is drafted to the politically compromised rescue mission. Leaving behind the sanctuary of his ramshackle temple, Seris must venture into the wild, unconquered lands and uncover the truth before tensions in the empire erupt into war. While Hunt for Valamon isn’t as boisterous and light-hearted as The Other Tree, it still has the same spirit of wonder and touches of quirk. The story is a shade darker, a fraction more complex, dealing with issues of vengeance and mercy, the cycles of war and the power of compassion. But at heart, it’s a fantasy story with a sense of adventure, discovery and hope. Nathan: Thanks so much for your time and best of luck with the launch of Hunt for Valamon. Where can people find copies in digital and analogue formats? DK: Thanks, it’s been a pleasure. Hunt for Valamon will be available in paperback and ebook formats, in bookshops and online. You can already place pre-orders, and the release is on the 7th April 2015. I’ll be having a small launch party in Sydney around early May, and you can keep an eye on my website or sign up for my newsletter for more details closer to the date. Thanks for having me on your blog, Nathan!